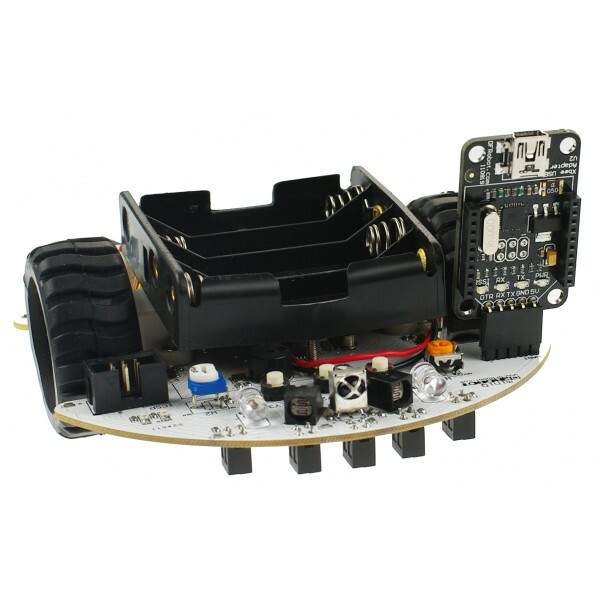 The MiniQ 2WD Robot is a small Arduino compatible robot that comes fully assembled and ready for play. 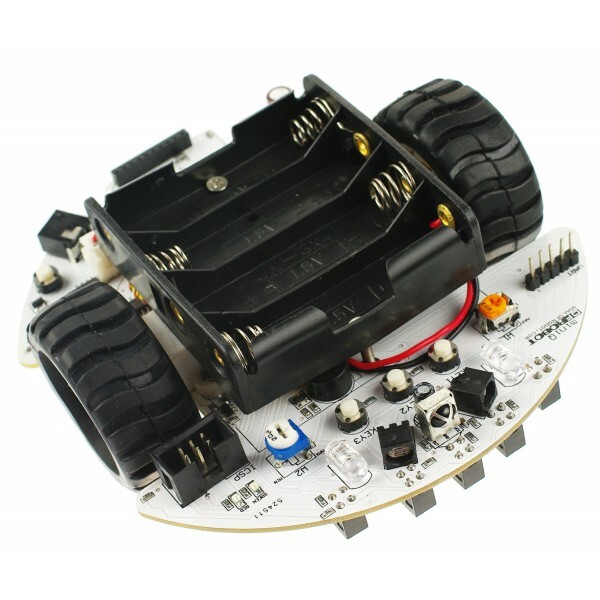 This robot features the popular ATmega328p microcontroller as the robot's fully programmable brain. A set of two high quality metal micro gear motors get the robot rolling and each comes complete with encoders for monitoring wheel rotations. Plus, this little robot has a complete set of onboard sensors for line following, edge detection, avoiding obstacles and seeking light or dark areas of its environment. The MiniQ robot has three user buttons for selecting program options and other purposes. It also comes with a remote control so you can control the robot from a distance. A buzzer allows the robot to beep at you or play simple tunes. This set includes a USB programming module and cable and a compatible IR remote controller. Four AA batteries are required. We always recommend using rechargable batteries. Fully programmable Atmel ATmega328P microcontroller robot brain. Five bottom facing IR reflectance sensors for map navigation and edge detection. Two forward facing IR transmitters for obstacle avoidance. One forward facing IR receiver for obstacle avoidance and remote control. Two forward facing CDS photocells for seeking light or dark. Two motors with encoders to fully control the speed of movement. Travels at speeds up to 31 inches per second. A ball caster for stability. Three user input buttons wired to a single analog port. A buzzer for making beeps and playing tunes. An ICSP interface for advanced programming. Handy power and reset buttons. Make sure to have 4 charged batteries in place before programming the 2WD MiniQ Robot. It runs on battery power while programming. Connect the robot to your computer using the included Mini USB cable. Install the USB to Serial drivers availble from the links below. Your computer will recognize the MiniQ as a serial port. Press the "PWR On" button to turn on the MiniQ robot. You should see a blue glow from the bottom of the robot. Download and install the latest Arduino IDE. Select "Arduino Nano w/ ATmega328" from the Tools->Board menu and make sure to select the appropriate Serial Port as well. Your MiniQ robot is now ready to program.